It is oftentimes said that runners have a love/hate relationship with their activity of choice. 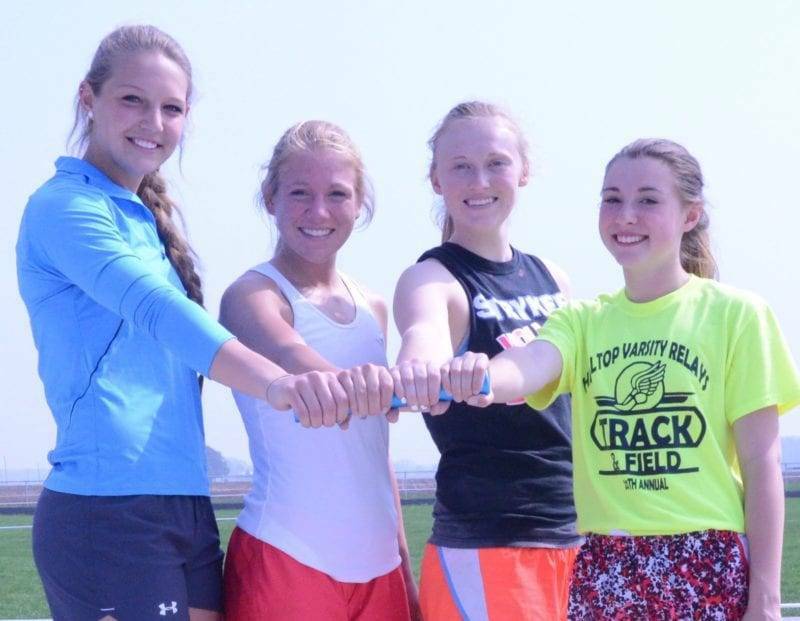 Perhaps there is no greater example of this than the Stryker girls 4X200 and 4X400 meter relay team. The group consists of sophmore Paige Speelman, juniors Brittany Breier and Audra Rupp, and senior newcomer to the squad Gabrielle Paxton. In a unique display of mental toughness, all four of the Lady Panther girls seem to dread one of the very races in which they choose to compete. Paxton expressed this very sentiment when reflecting upon the 4X400 meter relay. Speelman agreed with the upperclassman. “We love it when it’s over.” Corrected Rupp. And there’s a lot to love with the results this team is putting up thus far this season. Together, they’ve broken several records, including the school mark for the 4X200 meter relay Speelman, Breier, and Rupp helped to set just last year. They did this at the Hilltop Relays, were the team turned in a time of 1:52.2, which is also a meet record. Even the dreaded 4X400 meter relay saw the Stryker girls dominate, as the quartet completed the race with a new meet best 4:26.8, more than thirty seconds before the next finisher crossed the finish line. That isn’t their best time of the year in the 1600 meter relay, though. In a quad meet less than a week later, the girls ran a 4:19, less than a step behind their counterparts from Pettisville. The loss didn’t sit well with them. “Losing to teams just makes us want to fight harder.” Breier confessed. That proved true at the Lamberson Invitation later in the week, when the Panther unit avenged the defeat by placing first in both the 4X200 and 4X400 relays. Pettisville fielded teams in both events. A major component of relay racing is determining the order in which each runner will carry the baton. The goal is to have the fastest two competitors begin and end the race, ensuring a strong start and finish. For the Stryker girls, Speelman kicks things off, handing the baton over to Paxton, who carries it to Breier, leaving Rupp to finish the race. This determination was not made by accident. Regardless of the order, however, a missed handoff can be the difference between victory and defeat, particularly in the 4X200 relay. Because of this, the girls work on passing the baton to one another constantly. Yet this is one minor advantage the 4×400 has over its 800 meter rival. “You can catch up in that.” Speelman claimed of the 4X400. The downside is the toll the event can take on a runner physically. It’s not an uncommon occurrence for the other three teammates to be holding Rupp up at the conclusion of the final lap. That’s not to say they feel the strain any less, as they all tend to feel as though they’ve been through a war by the conclusion of the event. “And then we usually hug each other.” Breier confessed. Prayer is also a team activity between the girls. “We run for God.” Added Breier, whose statement displays a source of inspiration, rather than a claim of divine intervention. With so much already accomplished, one might ask what it is the team hopes to achieve next. “The goal is for us to get out of districts in the 4X200.” Answered Speelman. “And we really want to beat Archbold.” Breier ammended. The closeness between the four girls sort of prevents any one of them from being a bona fide leader of the group, leaving it to their coach to keep them working toward such lofty self-expectations. “Freshour is our leader.” Breier said of their head coach. “He believes in us so much.” Speelman chimed in. That most certainly is true. Though being involved in the program for four years, this is Coach Larry Freshour’s first year at the helm of Stryker boys and girls track. His experience with the record setting squad has been inspirational for him. And despite how much they may despise a certain event, it doesn’t deter their work ethic in the slightest. “They’re not afraid of hard work.” Confirmed Freshour. In fact, it was when he saw how hard Paxton was working in the offseason that he approached her about joining the relay teams. Foregoing her senior season of basketball, Paxton instead worked to transform herself into a better hurdler, the events for which she’s made a name for herself. Freshour was quick to notice the change in his runner, as it was apparent even in the school hallways. That pushing is not limited to track, either, for any of the girls. And not even a love/hate relationship can get in the way of that. Be the first to comment on "Stryker Relay Team Breaking Records, Defining Teamwork"